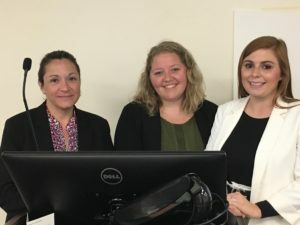 On Saturday, September 23rd, HLA attorneys Heather Prado, Amanda McHenry, and Nancy Farrell will present at the Family Court Defense Seminar on “What is Imminent Risk?” They will discuss the pertinent statutes and case law surrounding imminent risk that results in or prevents the removal of children from their homes. They will also present scenarios for discussion and talk about attorney’s professional and ethical responsibilities to clients in evaluating imminent risk. Additionally, they will talk about the training and standards case workers for presentment agencies utilize. This seminar is a collaboration between the New York State Defender’s Association, the Onondaga County Assigned Counsel Program, and Hiscock Legal Aid Society. This seminar will take place at the George Lowe Center for Justice at 221 South Warren St. in Syracuse.